Private debt in Australia has escalated beyond the $2 Trillion mark shooting past Australia’s GDP of $1.6 Trillion by 123%. Housing affordability is reaching crisis levels driven beyond the budgets of many Australians, by negative gearing and capital gains concessions. In fact, we have just bypassed Denmark (the previous first placeholder) to hold the prize for the single largest ratio of household debt to GDP. Our government net deficit/debt is minuscule by comparison at only 17% of GDP. It was only 11% when Labor left Office. At the time, Australia had the third smallest net government debt relative to GDP in the OECD. Unfortunately, the sheer hysteria over government debt expressed by Joe Hockey led many voters to believe this was significant. Ignoring that Australia used to be one of the world’s best-performing economies in 2013. One of the predominant components of any magic act is the art of distraction. 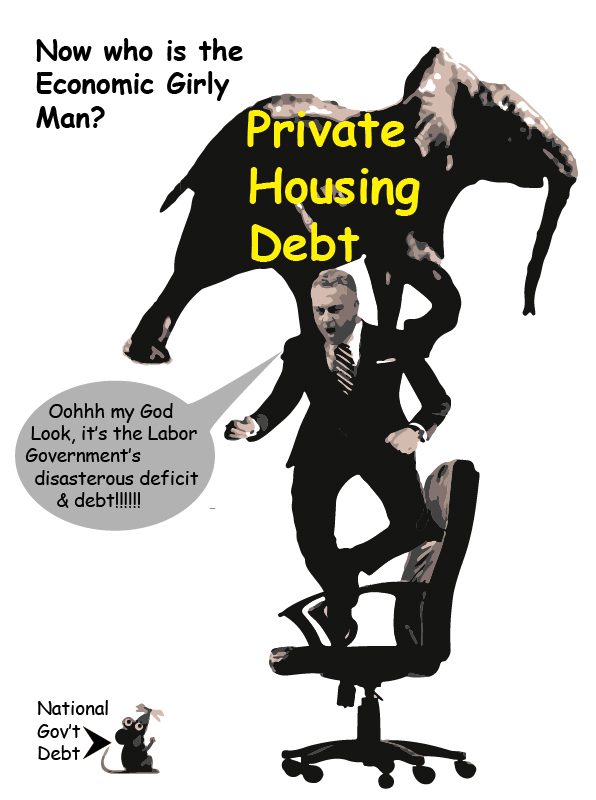 Hockey, and later Morrison, frequently shrieked at the “mouse” of Government debt to catch your eye, while allowing the “elephant” of private debt to sneak across the stage. Despite doubling our deficit since then, we are still in an internationally enviable position as far as Government net debt is concerned. A little perspective on the debts of our nation? The issue of negative gearing has been confusing for both the Coalition and the public. Kelly O’Dwyer was contradicting Malcolm Turnbull on whether or not the revocation of negative gearing would result in house prices falling or rising, did nothing to assure the public. ABC’s Lateline hosted a debate between IPA Stalwart, Sinclair Davidson and economist Saul Eslake on the 10th of May 2016. Saul suggested Negative Gearing (which he has opposed for 30 years) was costly and ineffective for its originally intended goal. Saul referenced the Reserve Bank’s analysis and the Grattan Institute’s research, as supporting his case. Davidson referenced his own personal “number crunching” but mainly appeared to channel his inner apprehensions over losing negative gearing. Curiously he claimed the “poor folks” who earned only $100K a year were not “rich”. (Despite that only 10% of Australian taxpayers can earn more than that.) With that redefinition of “relative poverty” in place, he argued negative gearing was not “a lurk or a rort for the rich”. He provided neither his “modelling” nor independent evidence that the absence of negative gearing would cause housing prices would decline. He was, although, perfectly prepared to disparage the modelling conducted by the Grattan Institute. In fact, pages 30 to 32 of the report go to some length to explain why it is unlikely to do as Davidson feared. These pages explain that a 2% reduction in the normal 7.3% average growth experienced since 1999 is the most its absence would affect the rate of growth. Negative gearing is designed to compensate for the losses encountered by a borrower for an investment property where the rent and costs of managing the investment exceed the cost of borrowing. In Australia and New Zealand deductions for negatively geared losses on a property can be made against income from any other source. In other countries, this is quarantined. For example, in Canada, losses cannot be offset against wages or salaries. Similar restrictions exist in the UK and Netherlands. Australia has by far the most generous conditions now. Before 1985 it had been quarantined so losses could not be transferred to an individual’s income from labour. Between July 1985 and 1987, the Hawke government abolished it and rent prices fell everywhere except in Perth and to a lesser extent in Sydney. This price fall was not due to Negative Gearing’s absence, but the meagre “available” vacancy rates and competition from inflated rent prices. (Grattan Report: Page 34-34) After that though, a less quarantined negative gearing was reinstated. Negative Gearing was originally touted as a means to increases the supply of rental property and decreases the rent charged by Landlords. Lobby groups with enormously financially vested interests such as the Taxation Institute of Australia and Real Estate bodies continue to do so. Like bad journalism, they have a dislike for when the facts get in the way of a good story. In fact, precisely the opposite of their claims has occurred. While housing construction has grown, occupancy or use has not. Sydney, by way of a singular example, is a City of between 90,000 unoccupied homes. There are 83,000 in Melbourne. Notably, we have 45,000 homeless, Australia wide. So the myth of housing scarcity that requires Negative Gearing to support it is not born out of anything other than a fabrication. That isn’t to say that the “scarcity” isn’t artificially maintained by refusing access to these unoccupied properties. These properties are primarily bought by Chinese investors needing to launder illicit funds. The argument put forward by the Government though is that the majority of negatively gearing taxpayers earn under $80,000 and revoking it would adversely impact these “mum & dad” investors from “getting ahead”. As Tax earnings go, it’s an interesting choice from which to start. Especially when you consider that the median wage in this country is more accurately $52,000. Only 40% of negatively gearing taxpayers lie below this median income. So why do the Liberals and the IPA spokesman, Sinclair Davidson, begin focusing on $80K? It’s not the average medium wage, so what does it represent? Is it because it is the lowest rounded number figure in which the majority of negative gearing taxpayers exists below? That being 67%. (Cart before horse thinking?) It’s the point at which the Liberals can confidently say the “majority exist”. Taxpayers that earn greater than that $80k demarcation represent only 20% of all taxpayers. There are three problems with this analysis spoken of in these terms. The large percentages are a deception because we are talking about a minimal subset of all taxpayers. We are using taxable income as the measure after they are adjusted for negative gearing. The undeclared interest these politicians have in maintaining the status quo. Notice the use of the term “negatively gearing taxpayers” because the reality on the larger scale is, that “negatively gearing taxpayers” represent just under 10% of ALL taxpayers. So regarding total taxpayers it is 6.7% of all taxpayers that negatively gear and earn less than $80,000. Conversely only 4% of all taxpayers therefore negatively gear and earn less than the median wage of $52K. More than 90% of taxpayers don’t negatively gear and just want an affordable home in which to live. The level of “earning” is based on declared income to the Tax department after negative gearing losses have been deducted. As many corporate figures and recent tax avoidance scandals do suggest, there must be a lot of individuals pulling in very, very large incomes but whose “declared” income is so modest that they pay negligible tax. The whole purpose of negative gearing is to lower your “taxable income”. (Grattan report: Pages 27&28) So using a measure of “Taxable income” as a valuation is a smart statistical deception. “The typical tax savings for negatively geared individuals is $1,800 per year”, although it may be as much as $11,800. An individual could conceivably be earning the pre-gearing taxable income of $90K a year and still fall into the category of being “below $80K of taxable income”. If you take out rental losses from negative gearing from taxable income then only 56% of people who negatively gear are in reality earning less than a disposable income of $80K (or 5.6% of all taxpayers). A similar adjustment for the median average taxable income is 33% (or 3.3% of all taxpayers). Negative gearing mainly benefits those on higher incomes as the top 10% of taxpayers receive almost 50% of the benefits from it. (Grattan report: Pages 27-29) The suggestion that it doesn’t, borders on hallucinatory ideology or deceit. This is the realms of magicians and conjurers. Even before becoming Prime Minister as a high-profile Communications Minister, Malcolm Turnbull owned an impressive portfolio of seven properties, and many of his ministers have similar conflicts of interest. Interestingly it is Turnbull’s electorate who are the biggest negative gearers in the country. It is no wonder the Government resists any action to repair the economic damage done by this facility. Warnings about housing bubbles bursting have appeared for a while. As Jessica Irvine wrote in the SMH, Sydney houses now cost “12 times the annual income”, up from four times from Gough Whitlam’s time. Jessica went on to describe it as a “classic Ponzi scheme” which is even how Liberal Backbenchers like John Alexander have described it. 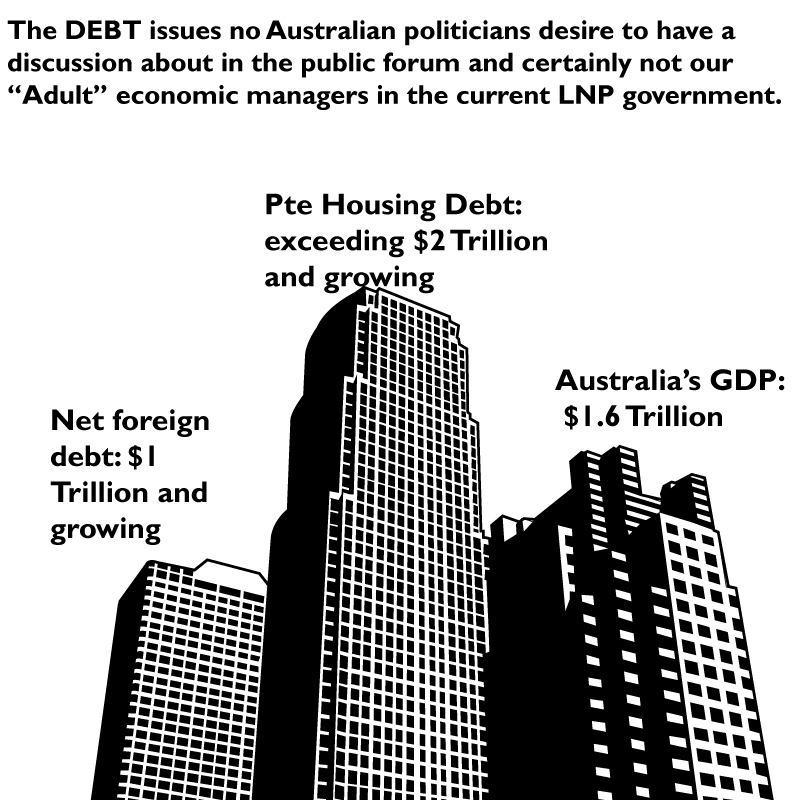 Walled Aly discussed these faults on “The Project” on the Coalitions negative gearing claims, which may engage from the perspective of the graphics, the numbers quoted and the nonpolitical research provided.